"They [illustrations] proved one thing... Our American "Femme Mimics", no matter how "beautiful", can claim no monopoly on beauty." 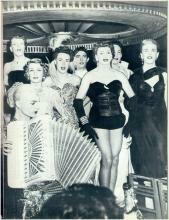 Quote: at that time the fishnets were made by wrapping rubber threads in nylon. 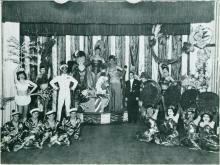 The site I found those pics at it claimed several of the men featured started their careers in traditional, supposedly 'all-girl' showgirl troupes, I'll try to find it again. Of course, there are persistent rumours that many of the apparently female dancers in modern-day Las Vegas chorus lines are in fact men. Quote: Barbette was an American female impersonator, high wire performer and trapeze artist born in Texas on December 19, 1899. Barbette attained great popularity throughout the United States but his greatest fame came in Europe and especially Paris, in the 1920s and 1930s. Barbette began performing as an aerialist at around the age of 14 as one-half of a circus act called The Alfaretta Sisters. After a few years of circus work, Barbette went solo and adopted his exotic-sounding pseudonym. 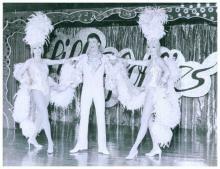 He performed in full drag, revealing himself as male only at the end of his act. Following a career-ending illness or injury, Barbette returned to Texas but continued to work as a consultant for motion pictures and training and choreographing aerial acts for a number of circuses. 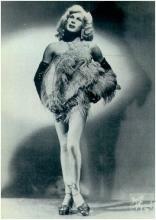 After years of dealing with chronic pain, Barbette committed suicide on August 5, 1973. For what period of time? What countries? (09 Apr 2011, 02:52 )Like Ra Wrote: For what period of time? What countries? With one or two exceptions they all performed previous to about 1965 and most are USA based. I'm sure the likes of the Wiemar Republic (as per Cabaret) had many more though. 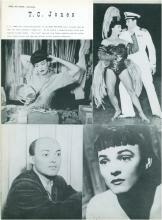 I worked on stage and in theatres of the era. Those fishnet tights of the 1950s were indeed really snug on the girls ... so much so that the girls' legs are resembled waffle irons unless they wore a pair of sheer or even cotton tights underneath. For an hour or so onstage they might wear the fishnets alone, but for longer times like and all-way show, they would declare the fishnets caused downright agony. At first, there were only very long fishnet stockings, which were not really very snug fitting. At first, the girls wore their fishnet stockings using very narrow garter belts, but when the fishnet tights came along, they became more and more snug. Particularly after Lycra because the fabric of choice after 1958, fishnet theatrical tights because VERY tight to wear indeed. Makers of the tights were Triumph, Capezio and of course, Danskin. The heaviest Lycra-elasticized fishnet tights were made with 65% Lycra elastic. That's as much elastic as the most elastic Playtex Lycra girdles from the Playtex "I Can Believe It's a Girdle" series of girdles. Imagine wearing theatrical tights as heavy and tight as a Playtex girdle! Current time: 26 Apr 2019, 08:48 Powered By MyBB, © 2002-2019 MyBB Group.